So last Sunday I woke up bright and early at about 5am to pack and drag myself to the Boston bus terminal to ride the Greyhound bus down to NYC. I have to say, 4.5 hours is a long time to be cramped in a chair, with the sun shining in your eyes the entire time. Still, I got to the Big Apple just before noon, and met up with my hung over friend Zheng to grab brunch near his apartment haha. I've been on a brunch roll lately, it's almost like I've uncovered a whole new cuisine altogether (I guess there were benefits to never eating breakfast!). At this place, whose name I can't remember but I know it's located on 9th Ave, I saw that eggs benedict was $9 (hah, no way I'd pay that price now!). What sparked my interest however was the large assortment of omelettes that the cafe served, and with a choice of whole eggs or egg whites. 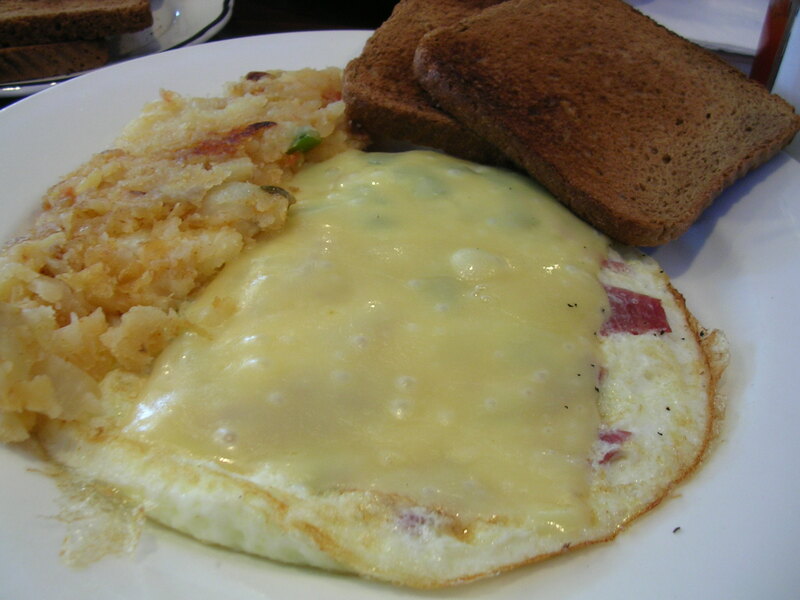 Feeling like I should eat healthy, I settled on an egg white Irish omelette, which had corned beef, onions, and peppers in it, topped with swiss cheese. It was served with a side of smashed and seasoned potato chunks and whole wheat toast. I have to say, it being the first time I've ever had egg white omelettes, it was really tasty! In fact, I would definitely choose it over whole egg omelettes simply for the health benefits, because I honestly thought it was just as good as the real thing. I think the swiss cheese helped give it a lot of savory flavor that perhaps the plain egg whites would have been lacking. The corned beef was also really tasty with the egg whites, something a little different from the usual ham or sausage meat additions. The potato side was not very interesting though, but I suppose it was nice to rotate amongst the different foods on the plate. And as you'd expect things to be in NYC, the price tag was steeper than I would see in Boston. This brunch platter cost me about $9 before tax and tip, and I only got water to drink on the side. 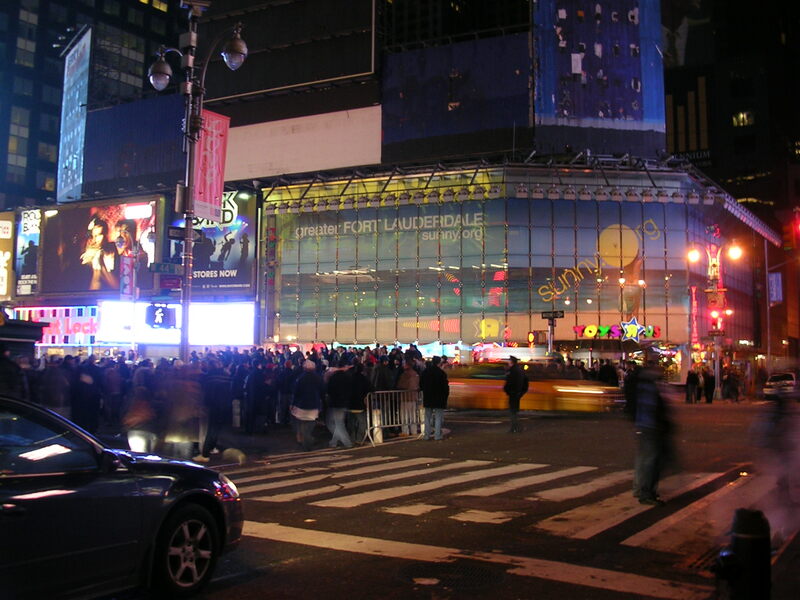 Later that afternoon, I walked with Zheng through the city to get to his friend's apartment for a Superbowl party. Having grown up in the Northeast, there is no way I could be anything but a Patriots fan, and I was a bit intimidated that I would be the only one at the party who wasn't rooting for the Giants. Luckily I was wrong, because otherwise it would have been really hard to watch the last few minutes of the last quarter by myself heh. 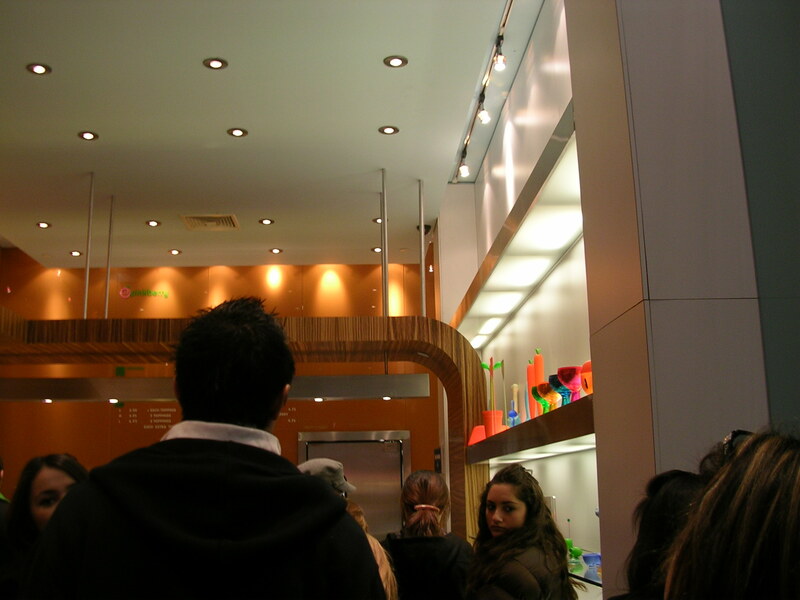 Anyway, on my way to the party, I was taking in all the sights and sounds of the city, and then I remembered that I've always wanted to try the frozen yogurt phenomena known as Pinkberry. Since Pinkberry stores are only located in CA and NY, I was set on getting a taste before I left. Zheng informed me that we'd be walking by "Koreantown", which is literally just one block of the city with all sorts of Korean and Japanese restaurants and stores, and that Pinkberry was located there. 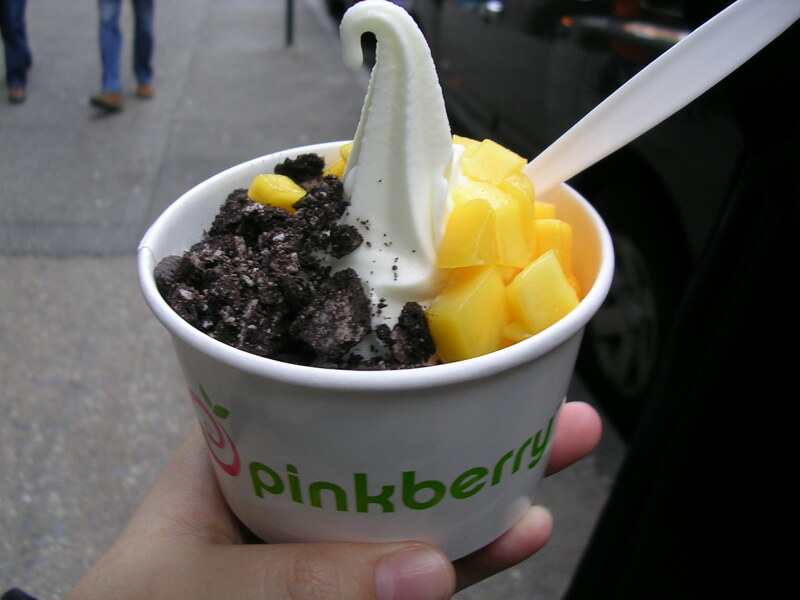 Apparently Pinkberry is a Korean frozen yogurt concept, which was news to me haha. Anyway, we made our little detour there and I was all giddy and snapping pictures because I've heard so much hype about this place and how celebrities love it. I have to say, the interior decor was nice and hip, very Korean-cutesy. I bet a lot of the people just come here for the decor alone, to be able to say that they hang out at the "cool" fro-yo place lol. 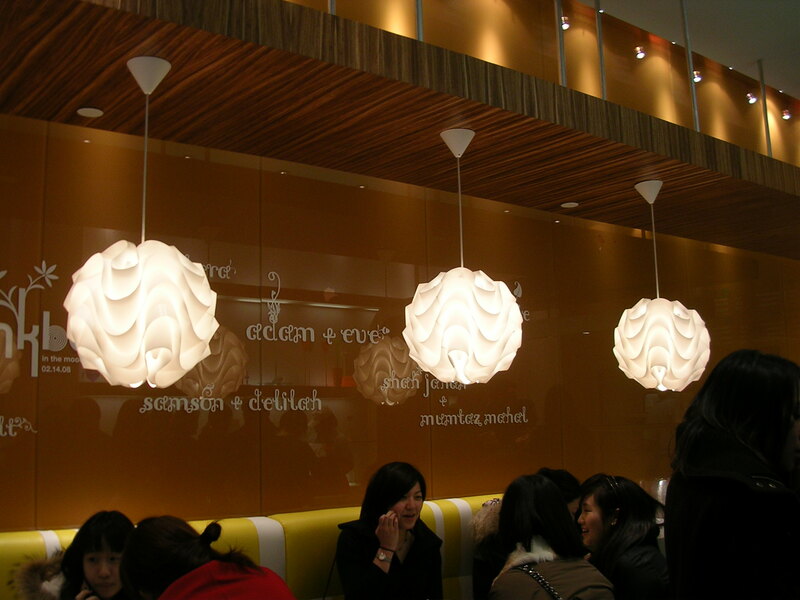 They had these big round white lights hanging from the ceiling, with undulating wave patters on them. Certainly very eye-catching and chic. On the walls were printed names of many famous lovers (Zheng was asking me what half of them were heh), although I'm not sure how it has anything to do with frozen yogurt or Pinkberry… I associate neither with… love haha. There was a long line from the cash register going all the way to the front door, all people waiting to be served on a winter's Sunday afternoon. Amazing. Notice the cutesy pastel things on the right side wall? I don't even know what they were supposed to be… but definitely your typical Korean cutesy items. The one thing about the way Pinkberry operates (btw all their staff was non-Korean) that annoys me is that they don't tell you anything before you get to the cash register. On the back wall are the prices (and damn, this stuff is over-priced! ), which say that a small yogurt is $3, and each topping you'd like to add is an additional $0.95. That's all it really says about the frozen yogurts. I figured out eventually that there were three yogurt flavors: original, green tea, and coffee. They don't tell you what the toppings are at all… how the heck was I supposed to order my $0.95 toppings?!? So when I got to the front of the line, I ordered a small original yogurt with 2 toppings, but the cashier said I needed to specify the toppings. Well you didn't have a list of them!! So I had to run up to the counter where they were serving the yogurt, which is like 7 feet away from the cash register, to observe which toppings were available in the serving bins. Normally that's not a big deal, but when there's like 15 people in line behind you, you feel terrible having to step out of line to figure out what toppings are available before coming back to order. What a poor system. Anyway, I chose cookies & cream (oreo crumbles) and mango chunks for my toppings, which made my small Pinkberry yogurt a grand total of $5 plus taxes. What a ripoff, seriously! For that price, I could buy a whole half gallon of premium ice cream at a grocery store! Moving on… the Superbowl itself was a pretty intense game to watch, and it was a lot of fun with a room nearly split 50/50 Pats fans and Giants fans. 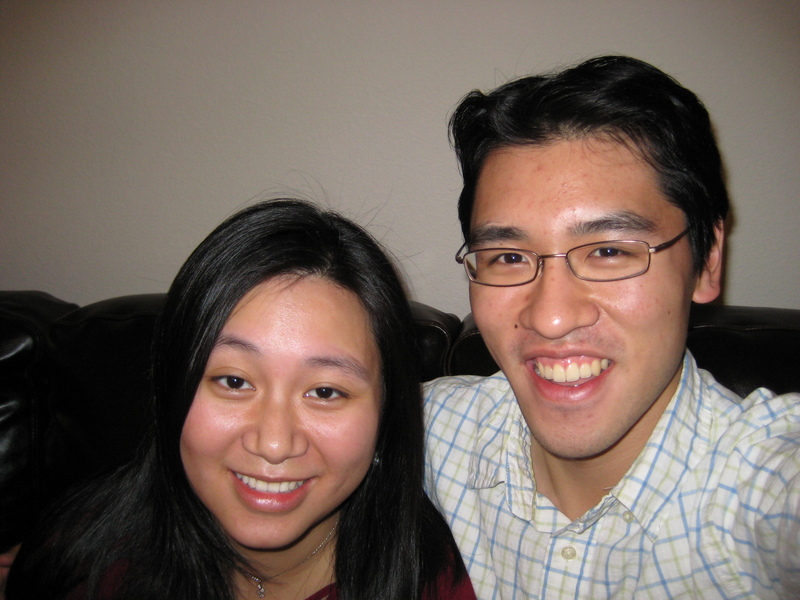 Zheng's friends had an enormous apartment (they had an entire floor of a building to themselves… with 2 bathrooms, 4 bedrooms, and a giant living room with kitchen. In fact, and this was exciting to me haha, the elevator of the building opens right up into their living room when you hit their floor button. How cool is that?!? Okay… sorry haha I clearly am easily excitable. We had the usual pizza and wings and chips and beer at the party, and then we stuck around for a while after the game since there were riots going on in Times Square (near where Zheng lives). We walked through some of that on the way back, and Zheng, a Giants fan, high fived a lot of random people in the streets haha. I saw policemen sitting on horses, trying to keep the order, but everyone was screaming and shouting and cars were honking (I almost got run over crossing the street). It was pretty crazy and a little scary too I have to admit, although I guess we've had our fair share of riots up in Boston for the Red Sox too heh. The next night for dinner, I went with Zheng to a little French-Italian fusion restaurant on 9th Ave called Nizza. Zheng wanted to get dinner from the Olive Garden, and I was having none of that chain restaurant stuff while out traveling, so we settled on this small but nicely decorated restaurant with decent prices (entrees $12-16 each). After being seated, the waiter came and told us about the menu, and informed us that the food here was a fusion of French food from the area of Nice and Italian cuisine. He also told us that the portions at this restaurant were about 3/4 normal entree portions at other places (no wonder it was priced cheaper than most places I saw), but that worked out nicely for us since neither of us can eat big portions anyway. We started off the meal with two appetizers, which the waiter told us were tapas-style and great for sharing. 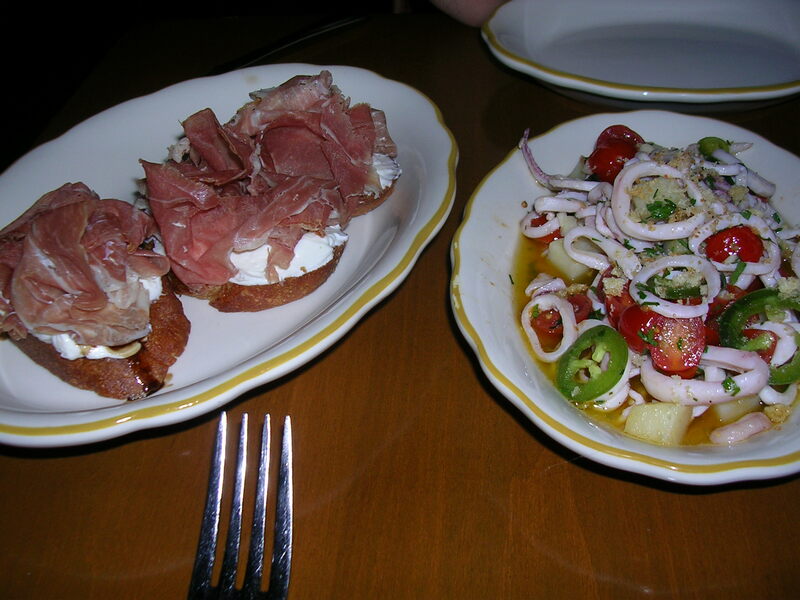 We got the warm calamari with potato salad, and a plate of prosciutto crostini with sheep's milk ricotta and balsamic syrup. (Sorry for the pictures with flash, it was just too dim in the restaurant). The calamari (right) was not fried as I had expected, instead it was naked and tender, probably braised. It came with little jalapeño pepper slices and grape tomato halves that were so sweet and juicy, in a savory vinaigrette sauce, on top of a small bed of skinned and cubed potatoes. I'm not a fan of spicy, so I let Zheng eat all the peppers, and he's not a fan of seafood, so he let me have most of the calamari (oops! I forgot he hates seafood and he didn't tell me not to order it when I suggested it). But in any case, the squid was just so tender, with that warm and perfectly soft chew that fresh and lightly cooked squid has. On the left is the prosciutto crostini with sheep's milk ricotta and balsamic syrup. It was soooo good. The prosciutto was fresh and lean, sliced very thinly so that it pretty much melted in my mouth. The flavor was wonderful too, not too salty, not too bland. It paired perfectly with the creamy sheep's milk ricotta, which was much milder than I thought it would be, but I thought that was nice, because it would have competed too much with the prosciutto otherwise. And then, with the sweetness from the balsamic syrup on top of a crunchy slice of French bread, I was in heaven with each bite. I really liked the ricotta, it was nothing like cow's milk ricotta with its gritty texture. This cheese was so smooth and creamy I could have sworn it was a different cheese altogether. What a perfect pairing of fine flavors and textures! Next came the entrees. Zheng ordered something that was pretty much like spaghetti with marinara sauce (it's not on the online menu right now), which wasn't interesting enough for me to waste a flash photograph on :P I ordered the crab ravioli, which came in a lobster cream sauce with fennel and parmesan. I think the thing about Nizza that impressed me the most was the freshness of everything they served. 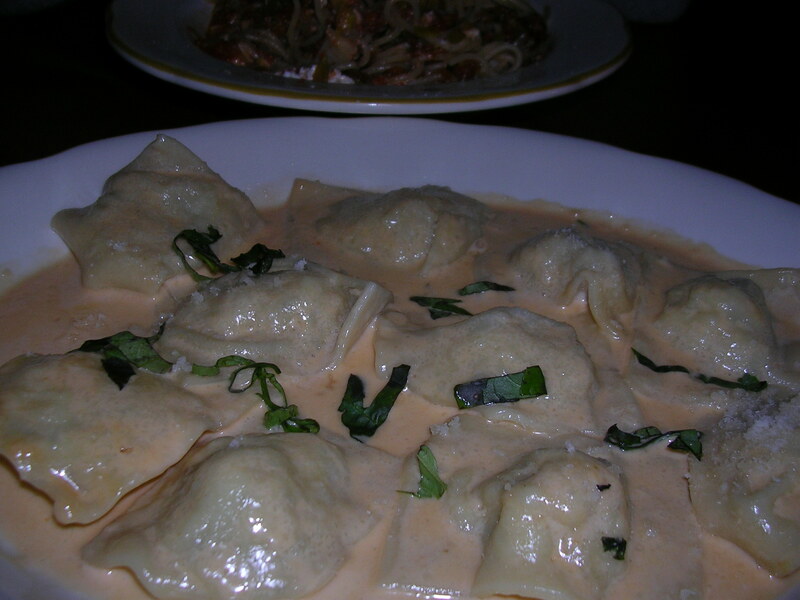 The ravioli blew me away with how tender and fresh the pasta skin was. It was this pillow-soft texture that I had never ever experienced eating ravioli or any kind of pasta before… simply amazing. The crab meat filling was silky and subtle, with the lobster cream sauce giving it most of its flavor. I really liked the added kick from the fennel in the sauce, which gave the creamy flavor an edge that made it memorable. The portion size was perfect, each ravioli was two bites, and I felt just satisfied after dinner. I had room for dessert, but none of the dessert options (of which there were 4 or so) interested me, so we left to grab dessert at a bakery on the way home. I would definitely come back to have dinner at Nizza again, the appetizers were fantastic and the portions were surprisingly just right (there's something to be said about being able to eat your whole meal and not feel too full or not full enough). The price tag with 2 appetizers is a little steep (I paid about $27 including tax and tip), but that ends up being about on par for dining in NYC, as I was seeing a lot of restaurants advertising prix fixe menus at $24-27 per person before tax/tip. So then on our way back to Zheng's apartment, I stopped by a busy little bakery called Amy's Bread, which had some tasty looking cakes on display, as well as a lot of sandwiches and breads. Apparently everyone else waiting in line was getting some of their fresh handmade bread to take home, too bad I'm not a big fan of bread. What caught my eye from the street were their red velvet cupcakes, complete with lots of whipped cream cheese frosting on top. 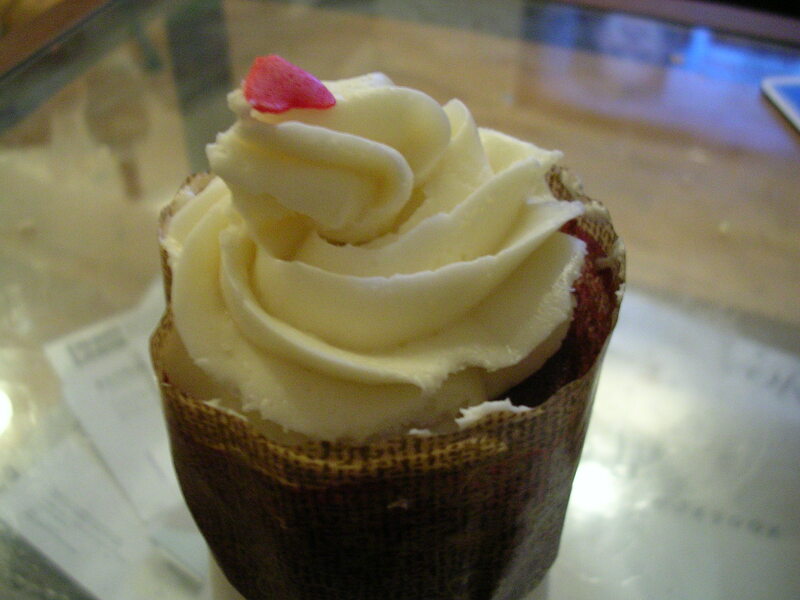 It was no Magnolia, but it looked just right for dessert (although $2.50 for a cupcake is steep!). So those were some of my food exploits on this trip, yummy and pricey as always! Until next time, NYC! So the past few days I've been visiting California to interview at Stanford and to see some college friends. The weather was amazing, it felt like Boston's spring. The sunshine was warm, there were palm trees, and dusty mountains in the distance everywhere I went. Stanford itself was the most extravagant campus I have ever seen. They really spend a lot of money spoiling their kids lol (maybe me one day?). The sunny happiness of the students being in a country club-like campus and a relaxing curriculum was really infectious. They were literally all smiles, and every student I met couldn't seem to shower the school with enough praise. I have yet to see a school where the students were this much in love with their school (Rochester and Dartmouth are distant seconds). 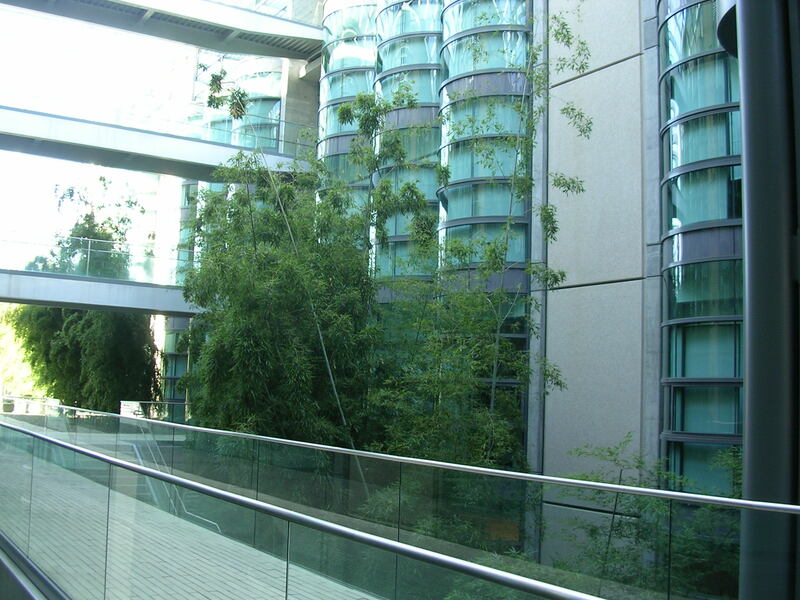 Um, bamboo forest in the middle of a building anyone? 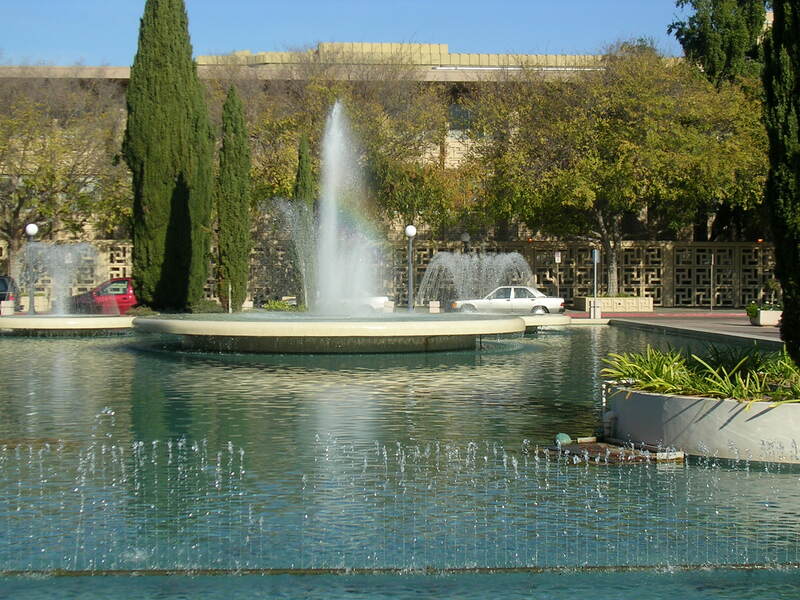 After seeing Stanford, I had time grab dinner with my friend Tony near the school. We walked up and down the main street with restaurants, and finally decided to stop in at a place called University Cafe, which served American food at a moderate price. 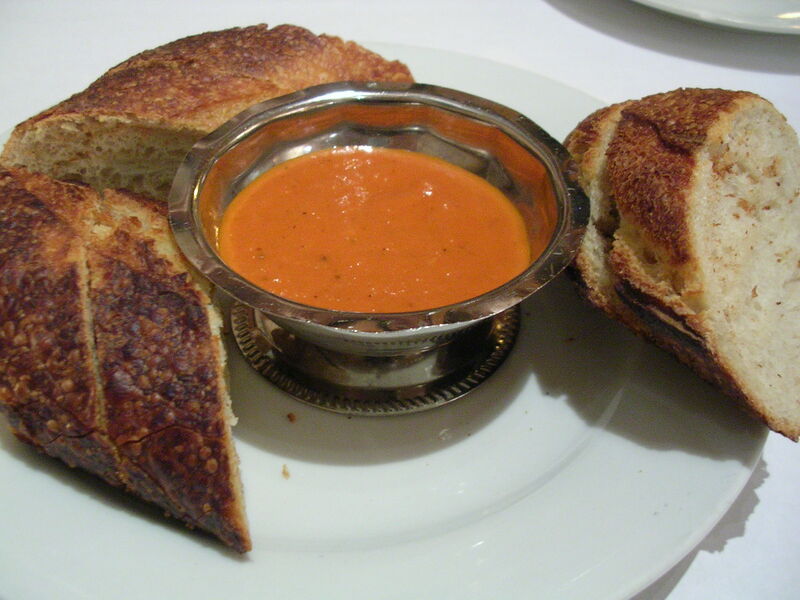 First came a bread plate with a tomato-based dipping sauce (I couldn't figure out why it was orange, but it was similar to a marinara I guess). The bread itself was too hard on the outside, and a little soggy in the middle, but it still tasted fine because we were both starving lol. For my entree I got a chicken pot pie with tossed greens on the side. 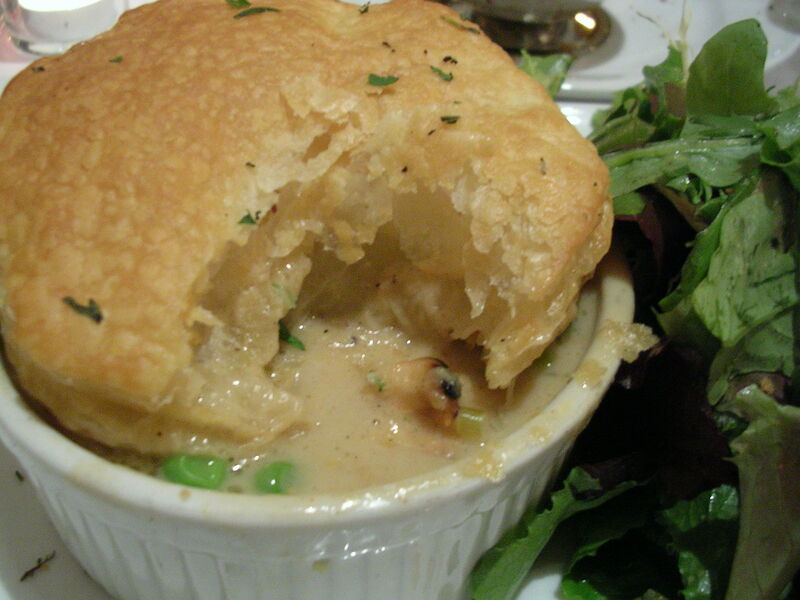 It was the type of pot pie that has a cap of puff pastry on top of the liquid pot pie, and I really like this kind of pot pie because it was the kind that Baker dining used to serve all the time. The pot pie filling itself was delicious, as it was sort of like a cream of mushroom soup, with asparagus, mushrooms, onions, peppers, corn, peas, and chicken chunks. The flavors came together really well, and even though I was starving when I came in, I was definitely satisfied afterwards. The greens on the side were tossed in a vinaigrette that contrasted nicely with the sweet creaminess of the pot pie. It was jazzed up comfort food, and it definitely hit the spot. Tony wanted to get a 12 oz steak au poivre, but the waiter got confused and gave him a steak salad instead lol. The steak tasted like it was marinated with teriyaki sauce, which I thought was kind of interesting. 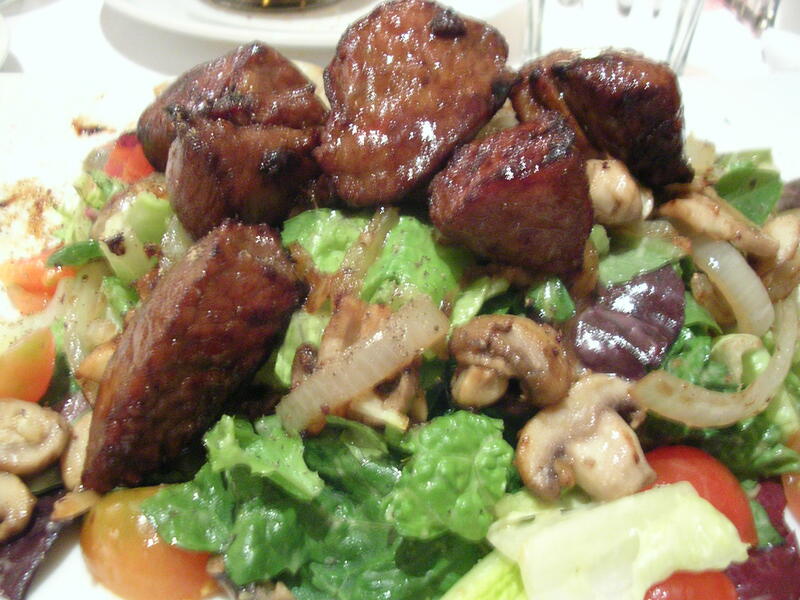 It came on top of a bed of stir fried vegetables and some salad. Not quite what he wanted, but at least it wasn't a bad replacement heh. (Sorry, pic is a little blurry, I blame Tony because he took it lol). And for dessert, we went across the street to a Japanese-European fusion bakery called Satura Cakes, where after trying some free samples of a very rich and dense chocolate cake, we decided on sharing a bread pudding together. For the life of me I can't remember right now what type of fruit was in the bread pudding, but I know the dessert itself was a great way to end the meal. 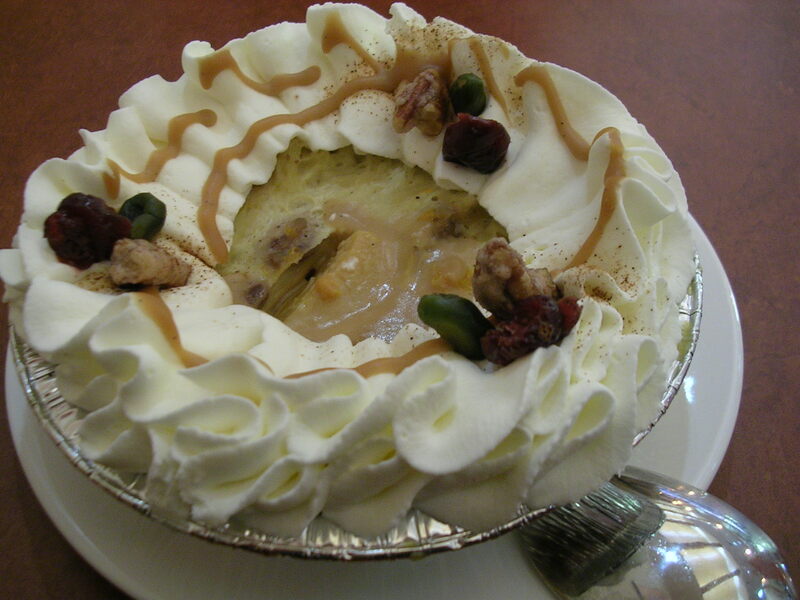 It had the spiciness of a pumpkin pie, with the soft-crunchy chunks of fruit like an apple pie, combined with soft bread and a creamy mousse-like filling, all topped with whipped cream. It was light and refreshing, and although it was cold, the flavor of the spices made a warm impression on me. It was a quintessential autumnal dessert, even though autumn has already passed. 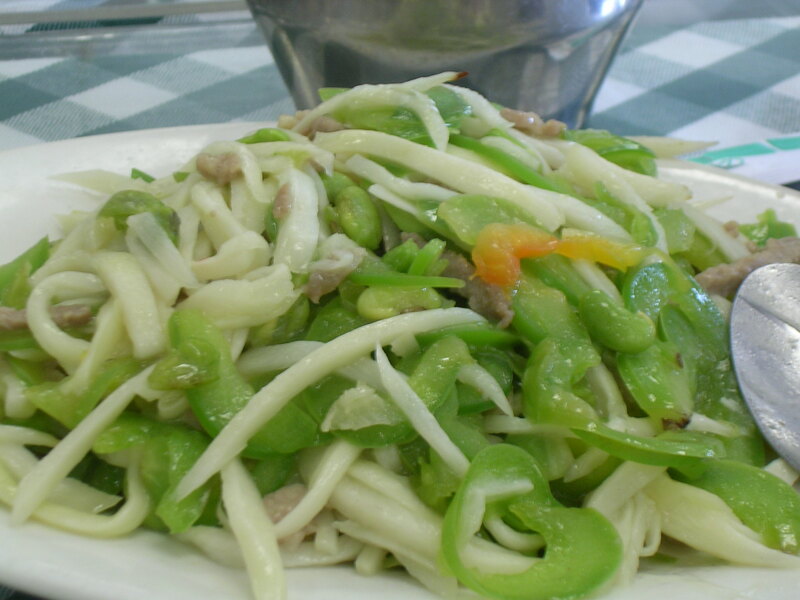 The following day for lunch, I went out with Tony and another friend, Linda, for Shanghainese cuisine at an Asian strip mall. The food was amazing, and reminded me of all the Shanghainese dishes that I've eaten growing up. We ordered "jiao bai" (water bamboo) with peppers and pork, "nian gao" (rice ovals) with napa and beef, pork liver in brown sauce, and "xiao long bao" (Shanghai meat buns). Everything was delicious, and the cooking style was light and clean, just like Shanghainese cuisine is great at when it wants to be. When I had this meal, I realized just how sick I was of the greasy, fried food of Cantonese cuisine up in Boston's Chinatown. They're not kidding when they say that Chinese food is better in California (there are so many Asians here!). And finally, a picture of me and my friend Tony (I'm almost embarrassed to post this because I look so stupid here, but I guess what the heck, it's for the memories right?). 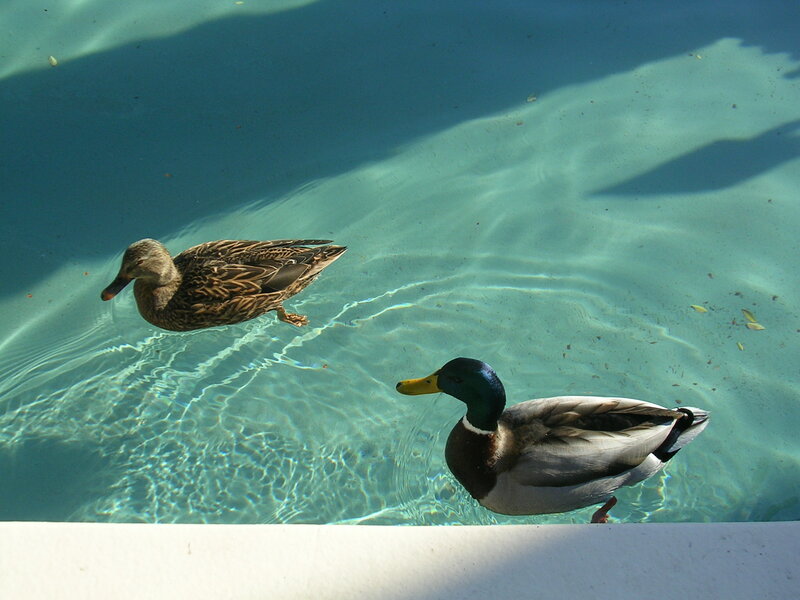 I wish I could have stayed a little longer, and done some more "Californian" things heh, but there's always next time! I just returned from a chilly but fun trip in NYC! 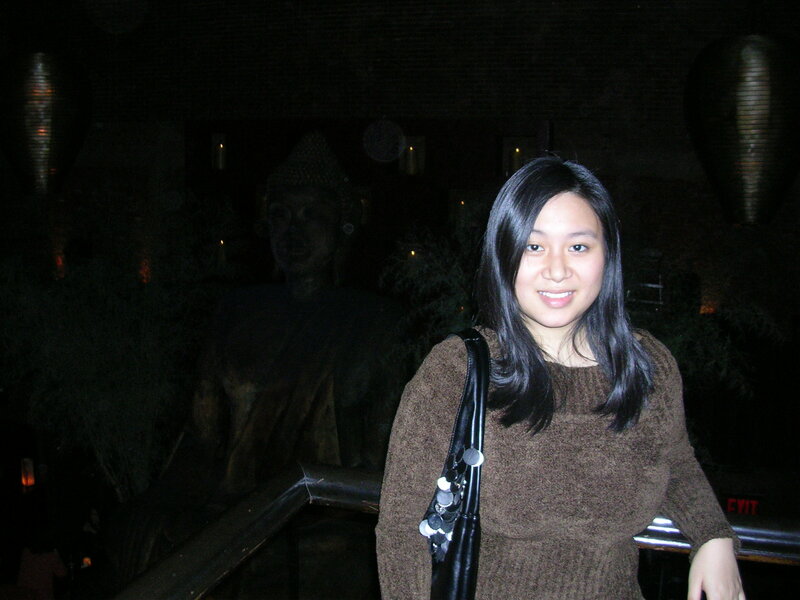 I visited for a little over two days, to attend two interviews and to see my college friend Zheng. I wish I had more time to spend in nyc, taking in all the beautiful sights and sounds and cuisine, but that simply means that I will be back again sometime :) The only bummer on this trip was that I was just at the start of a bad cold, so I was feeling fuzzy and stuffy the whole time, with not much of an appetite and a diminished sense of taste. Thus, I vow to return one day when I am feeling well! Anyway, onto the food! Unfortunately, out of dining etiquette, I did not photograph most of the food, because it was very dim and I really didn't want my flash going off left and right. We got drinks to start off, a beer for Zheng and a "Taotini" for me, which is Absolut Mandarin, Stolichnaya Raspberry, Malibu Rum, and cranberry and lime juices, all shaken up and decorated with a spear of fresh raspberries. Mmm refreshing! The Taotini is the most popular mixed drink at the restaurant, so of course I had to try that. I figured, this is probably the only time in my life I'll be able to have dinner at this place, so I'd better get the things its best known for. Appetizers were peking duck spring rolls and squab lettuce wraps, both of which were great. The duck rolls had some sort of paste inside that I was unfamiliar with (not the usual vegetable scraps), and I can only guess that it was a mushroom or bean paste. I made a real mess with the squab lettuce wraps, but they were delicious. 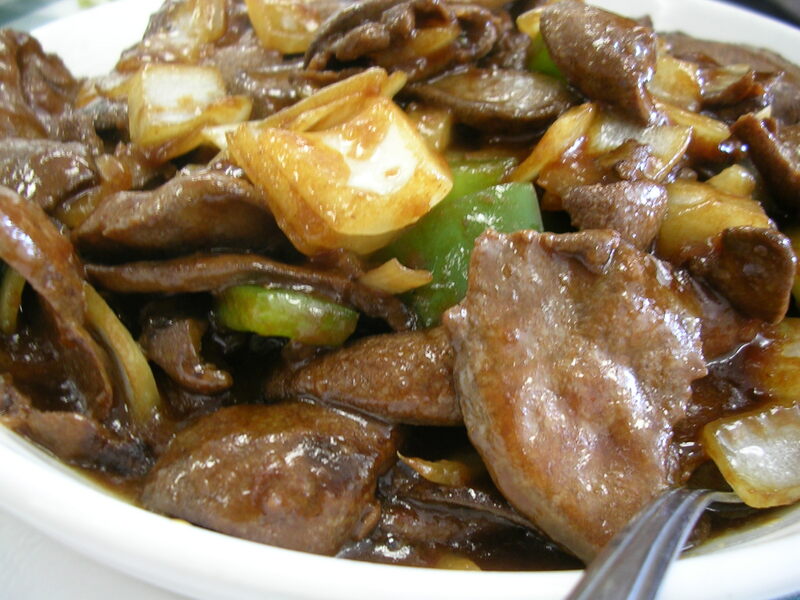 It came as a dish of ground squab, cooked with scallions in a soy-based sauce, for us to scoop into bowl-shaped iceberg lettuce pieces. I have never found lettuce wraps to be a food that can be eaten without making a mess, and Tao was no exception haha. But you know, the more hands-on the food is, the more tasty it can be! 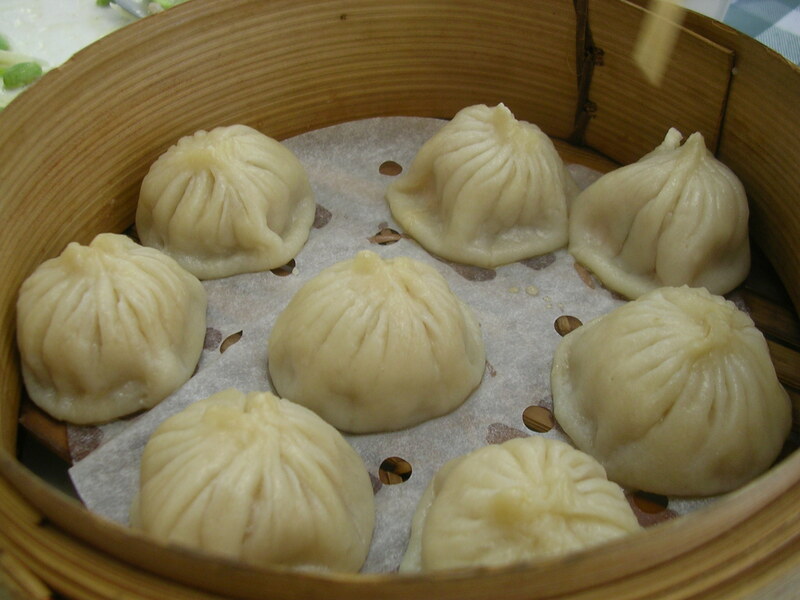 Next came entrees – Zheng got the 12 oz. kobe beef ribeye (probably the single most expensive item on the menu, at $88, only topped by the special of the night, which was a kobe beef filet mignon at $200), which came with fried onion strings. 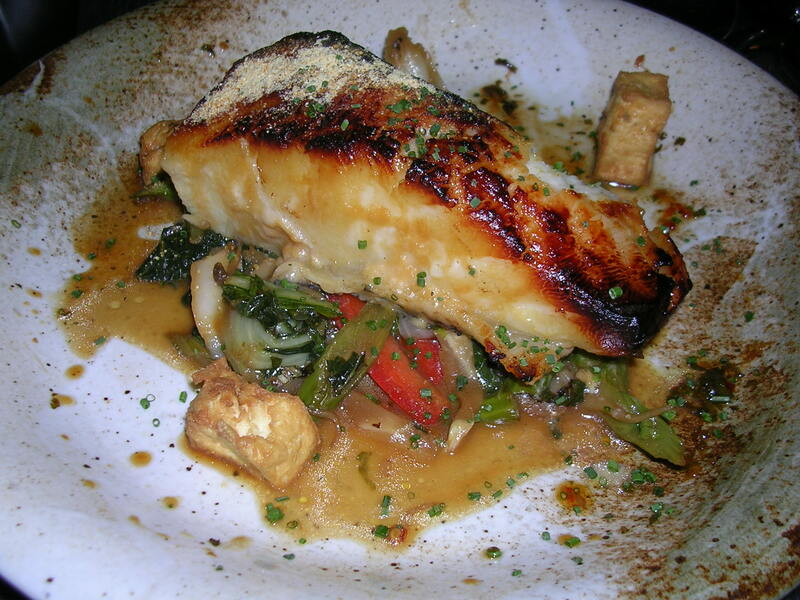 Tao is probably best known for its kobe beef, but I would decide to get another one of their highlights, the Chilean sea bass, which came grilled on top of a bed of stir-fried vegetables, and topped with a miso glaze and powder. I can't even begin to describe how wonderful the dish was, I only wish I had a bigger appetite so I could have finished the huge filet. The fish was tender on the inside, and crispy on the surface from the sear. I adored the miso powder and glaze, which was a perfect dichotomy of salty and sweet. The wok-cooked vegetables at the bottom of the dish were lacking in taste and texture, as they were wilted and much too salty, which did not enhance the fish at all, so I left most of it and focused on my sea bass instead, so delicious! I'm so glad I chose this dish, it suited my mood perfectly, because it was not greasy at all and had a delicately sweet flavor and tender texture, all of which suited me in my state of sickness. At a price of $34, it actually is not bad, considering how big of a piece of fish you get. Finally, dessert. We were both super stuffed after our entrees, but somehow the dessert menu ended up in front of us, and well, I guess if we were going to go all out then we weren't going to skimp on dessert. We ordered a mochi sampling plate, which had six mochi ice cream balls sitting in a triangle shaped plate. The variety included: pistachio, pumpkin, raspberry with white chocolate, and chocolate with peanut butter. They were all so divine, and I really enjoyed the assortment of flavors (I think my favorite was the raspberry white chocolate one, followed closely by the pistachio offering). The pumpkin mochi ice cream was actually quite good also, with its warm spiciness it tasted just like a pumpkin pie, but more refreshing. Mmmm. After dessert was done, we were presented with two chocolate fortune cookies (I can't handle any more more food!! ), with funny fortunes inside. Tao was simply an amazing adventure, something so defining of trendy culture in NYC and yet satisfying all the same. Unfortunately I can't tell you what the final tally of the bill was, since Zheng refused to let me see it, but from my estimates, the total after tax and tip must have been just over $200 (!!!) Many thanks to him for treating me to such an extravagant meal, he's much too generous, I will probably never stop feeling indebted lol. So now in closing, an obligatory picture of me on the second floor balcony, trying to get the Buddha in the background. (Zheng refuses to take pictures with me, god only knows why. He claims it will be incentive for me to visit again, but that makes no sense to me whatsoever haha). 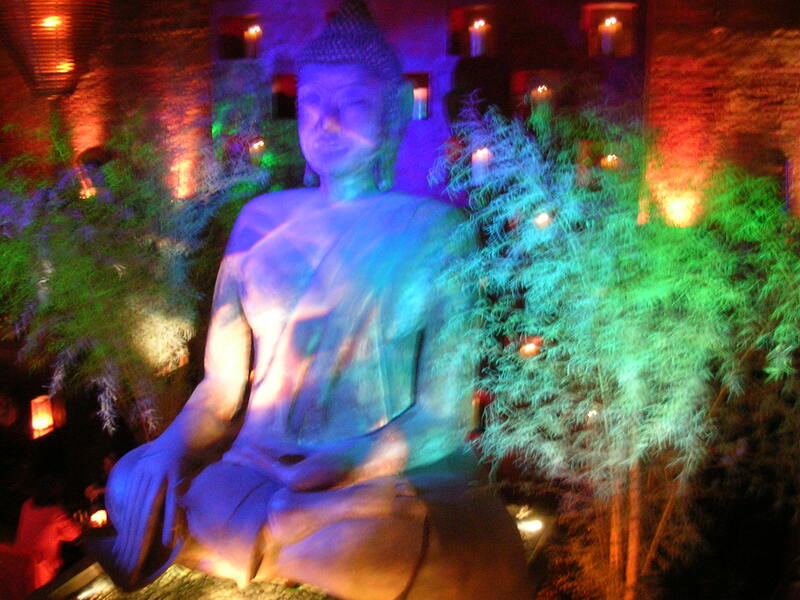 Anyway, unfortunately, the flash meant that I was too bright and the Buddha was too dark. If anyone is good with photoshop and can help me fix this picture, I would be so grateful!! !